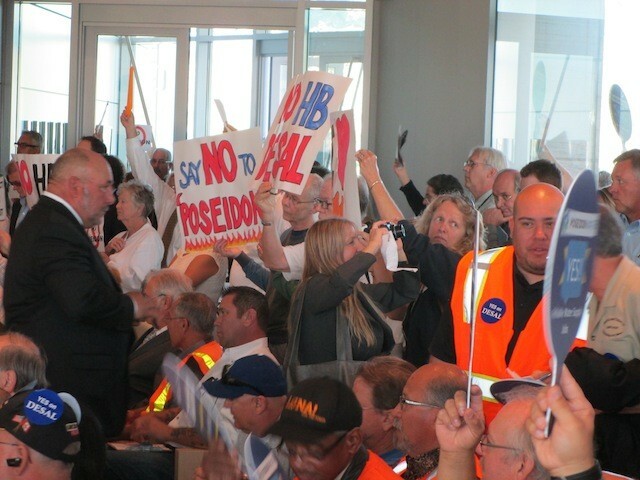 At a nine-hour meeting of the California Coastal Commission yesterday, Poseidon Water managed to wriggle free of the proverbial noose and keep alive its plan to build a nearly $1 billion desalination facility in Huntington Beach. By day's end, as the 13-member Commission deliberated, it became apparent that several members remained insistent that Poseidon invest in expensive upgrades to its intake system. Company lawyer Rick Zbur abruptly announced that Poseidon would withdraw its permit application, which came as a shock to some as the company has spent more than 10 years working its way through the regulatory process. 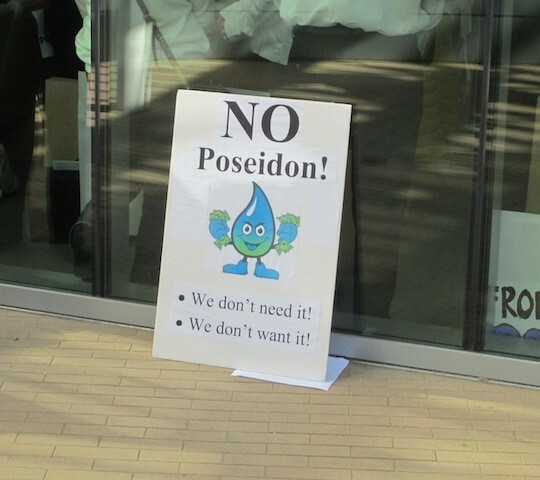 The legal maneuver will allow Poseidon to reapply for a permit at a date of its choosing, and company reps said they will now work with the Commission to address specific concerns. A study will be conducted to determine the feasibility of using environmentally friendly sub-surface intake pipes; Poseidon's current plan called for the company to use existing intake pipes owned by the AES power plant on PCH. In addition to drawing in 100 million gallons of water daily, the open-ocean intakes also draw in larvae, fish eggs and other marine life. Longtime critics of the project, including former Huntington Beach mayor Debbie Cook say the move is likely a cynical ploy by the company to buy time so it can continue lobbying state officials and build the plant on its own terms. “They're not going to work with the Commission. It's not like they suddenly found religion,” Cook said. Indeed, Poseidon has had months to consider Commission concerns. Back in April, staff members sent Poseidon a notice stating the company's application for a coastal development permit was incomplete. Among the issues raised was a Commission request that Poseidon study the feasibility of sub-surface intakes. In 2010, a state agency ruled the use of open-ocean intake pipes harmful to marine life, and as a result, the technology is being phased out. Currently, the nonprofit group CalDesal, chaired by Orange County Water District Director Shawn Dewane, is lobbying state officials to provide an exemption on the intake issue for desalination companies such as Poseidon. During yesterday's meeting, Commission staff, whose mission is the protection of coastal resources, once again made it clear they preferred intakes known as infiltration galleries, which would be buried in the ocean floor. Referring to Poseidon's current plan as a “huge ocean vacuum cleaner,” Deputy Director Alison Dettmer said the Poseidon plant would have a significant impact on the marine environment. Standing before the dais in Newport Beach City Hall, Poseidon VP Scott Maloni told the Commission that newer intake pipes would be inferior to the existing system and the increased cost would kill the project. Maloni's claims were buttressed by a report sent by Poseidon to the Commission on Monday, citing a study conducted by Water Globe Consulting (WGC). Though the report called sub-surface intakes infeasible, it was revealed during yesterday's meeting that WGC president Nikolay Voutchkov was a former Poseidon employee. As many as 300 people packed the council chambers to voice their support or opposition for the project. Supporters included union workers, many in reflective vests and hard hats, as well as politicians. Poseidon has said construction of the plant will provide for more than 2,000 jobs. Critics of the project included representatives from the Sierra Club as well as coastal-protection groups such as Orange County Coastkeeper and the Surfrider Foundation. In addition to voicing concerns about harm to marine life, critics argued that Orange County, which benefits from a large underground aquifer, doesn't need an expensive process such as desalination. At the end of the meeting, moments before Poseidon withdrew its application, Commissioner Dayna Botchco expressed her own doubts about the project. Once Poseidon withdrew its application, Commission Chairwoman Mary Shallenberger offered the company what she called a friendly reprimand. Poseidon will resubmit its application, and another Commission hearing will eventually be held.